Welcome to our New Website series, where twice a month, we’ll be featuring an e-retailer that we love and know our readers will too. Whether it’s an old but under-the-radar favorite or a newly launched label, you’ll want to report back to your friends with these finds (or maybe keep them to yourself)! Earlier this summer, WWD reported that jewelry has become the fastest-growing accessories category of 2016, beating both bags and shoes thanks to the rise of jewelry in e-commerce, where it once was largely left out. While this made it clear to us that jewelry has become more accessible than ever, what it failed to do is suppress our nerves about making such a big investment on something we’ve neither seen in person nor really had the chance to test out. Conveniently, around the same time as this report was published, Los Angeles–based brothers Adriel and Elliott Darvish provided a solution with their website: Switch. Through their experience in the jewelry business (thanks to their mother’s line Chains + Pearls), they saw firsthand the hesitation that comes along with trying to buy jewelry online and on a whim—not to mention the high price tag. That’s why Switch lets you rent designer jewelry (including Chanel, Hermès, and Balenciaga) for as little as $29 a month, without the commitment of buying and made easy with prepaid shipping labels. That’s less than $350 a year, which is comparable to a reasonably priced piece of designer jewelry, and still less than the average price of Switch’s jewelry options for you to choose from. If you think it sounds too good to be true, just wait until you see the pieces. Scroll through to read more about how Switch works and see our top picks for renting now! WHO WHAT WEAR: Can you tell us a little bit about when, how, and why you launched Switch? ADRIEL AND ELLIOTT DARVISH: We beta-launched Switch earlier this summer. The idea came to us after getting a glimpse of the jewelry world through our mom, who is a designer. We noticed that while women would fall in love with her pieces, some just couldn’t afford it or would wrestle with the decision of whether to actually buy something. We learned that nice jewelry isn’t something people buy on a whim—it requires a lot of thought. Then the lightbulb went off: Jewelry is perfect for renting. While clothes and most other things wear out over time, jewelry has a unique ability to last. So Switch was born: a subscription club where members can rent jewelry by designer brands like Hermès and Chanel at a reasonable price. Switch gives you an endless rotation of jewelry rather than spending all of your money on a piece you might be sick of by next week. It makes shopping for jewelry fun rather than stressful. Above all, Switch makes designer jewelry more accessible to everyone. WWW: Tell us how it works! AD & ED: It’s super simple: Subscribe. Style. Switch. Sign up and rank your favorite pieces from our collection. We send you your top pieces that we have available and you can keep them for as long as you’d like, whether it’s a few days or a few months. When you’re ready to switch, send them back and update your Favorites. As soon as we know your box is on its way back to us, we send your next one. Shipping is always free both ways. Our base plan allows you to have one piece at a time for $29 per month, but you can choose one of our other plans if you want access to more pieces at a time. WWW: How do you go about sourcing the jewelry picks? AD & ED: Our selection is highly curated. We choose our pieces based on suggestions, trends, and our members’ feedback. Luckily we’ve got a network of stylists and fashion insiders to run things by, and we also scour sites like Who What Wear to see what’s hot. We also adjust our buying continuously as we learn more and more about our members’ tastes. We try to have a healthy balance of classics and trendier pieces. The average retail price of our pieces is about $500, but we have pieces that go for less or more as well. We only buy from sources that can guarantee authenticity, and we try to have something for everyone. WWW: We’re dying to know: What happens if someone loses an item, and does that happen often?! AD & ED: When you sign up, we put your credit card information on file the same way a hotel does when you check in. If a piece gets lost or damaged in transit, it’s on us. Otherwise, if you happen to lose it, your card gets charged 80% of the retail price, but that happens once in a blue moon—we go out of our way to choose pieces that are secure and won’t easily fall off you. WWW: What jewelry brands are most popular with your customers right now? AD & ED: The iconic brands like Hermès, Chanel, and Balenciaga have probably been most popular, which isn’t very surprising. The vast majority of our members have had at least one of those brands in their Favorites. But we’ve been also been very pleased by how well our own branded line, Switch, has done. 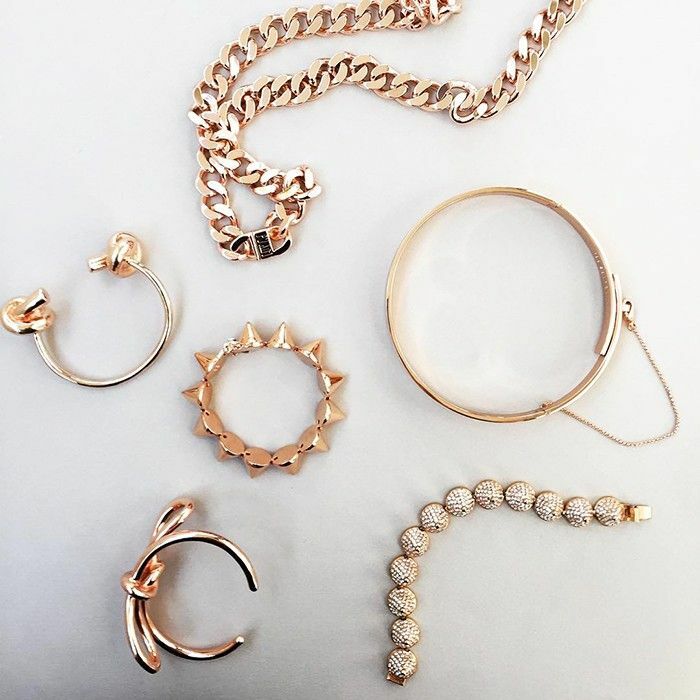 The Switch line consists of fine jewelry—mostly simple, dainty pieces like ear cuffs and diamond bars. WWW: What’s your single most popular item that people rent/want to rent most? AD & ED: The Jagged Edge Choker by Fallon has probably been our most popular piece, but all of our Fallon chokers are very hot right now. WWW: What makes Switch different from other e-retailers? AD & ED: Above all, our collection. No other rental site comes close to our selection of iconic brands. Most of the other rental platforms out there either carry lower-end, lesser-known brands or unbranded, formal jewelry. We also give our members a lot of control over their pieces. Some sites will send you something random based on a “style quiz,” which is cool if you’re into surprises. But we like to empower our members by letting them choose what they’ll receive next. And lastly, we strive to have knock-your-socks-off customer service. It’s not just a bunch of automated emails—we communicate directly with every single one of our members. Continue to see our top rental picks from Switch! Would you rent jewelry? Tell us your thoughts in the comments, and if you would, take half off your first month with promo code WHOWHATSWITCH!